David Bradley | The Robesonian South Robeson’s Cameron Werrell (44) collides with Fairmont defenders as he goes up for a layup on Friday as teammate Kylerr Page (1) watches on in the background. South Robeson closed the game on a late run to down Fairmont 66-65 at home. 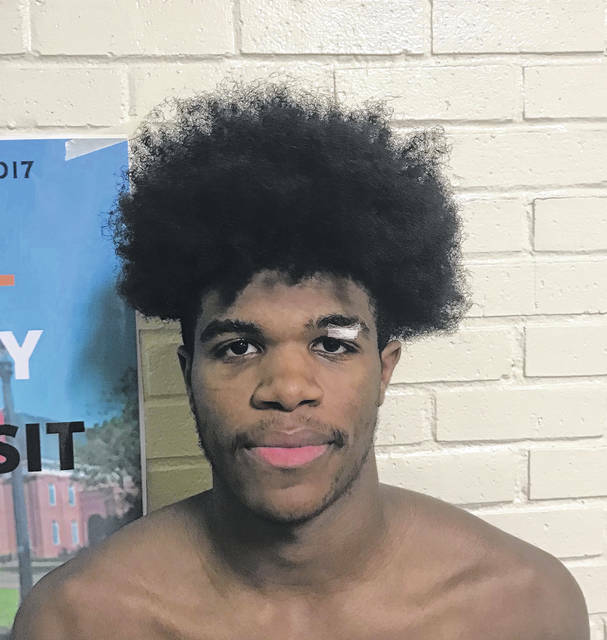 ROWLAND — South Robeson senior guard Kylerr Page set the tone of Friday’s Three Rivers Conference home battle with Fairmont with an exclamation point when he dunked the first two points onto the scoreboard seconds after the Mustangs won the tip. From there, the Mustangs rode the emotion of their senior leaders to end the 21-game losing skid to the Golden Tornadoes as Page provided plays late to secure the 66-65 win. 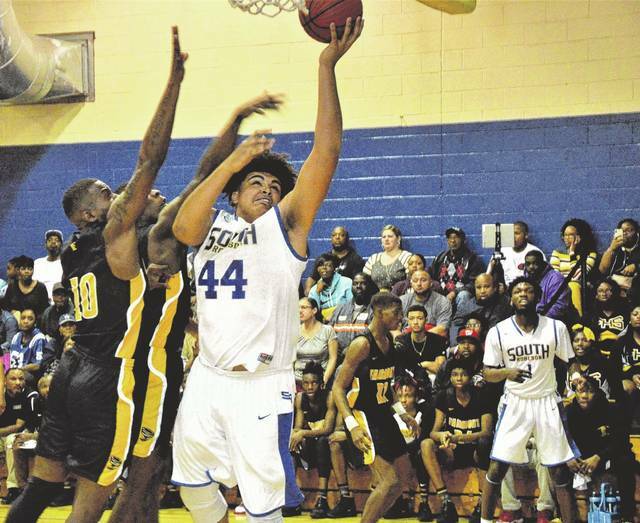 The victory for South Robeson (8-5, 5-3 TRC) is the first over Fairmont (4-9, 3-5 TRC) since 2010, and the win comes three days after the Mustangs picked up a learning lesson from a 19-point road loss at East Bladen. Going up against a Fairmont team that has hung its hat on guard play in recent years, the Mustangs were out to prove that their guards were up to the task. Page led the backcourt with 15 points and 10 rebounds, while fellow senior Daniel Murray added 13 points and Syn’cere Southern contributed 12. After coming out with six points in the first quarter, Page’s game went quiet with no field goals and four points from the line in the second and third quarters. During that time span, Fairmont took the lead inside the first minute of the second half and retained possession of it until Page found his moment to attack on both sides of the ball. “We didn’t panic. We looked at what we could be doing and that was defense. We had to play hard on defense,” Page said. Fairmont led by six, 55-49, with 3:14 left, before South Robeson’s charge led by Page and senior big man Cameron Werrell. Behind the scoring of the duo, South Robeson took the lead with 35 seconds left on a pair of Page free throws to go up 62-60. Chances to tie or cut into the lead in the following possessions were off the mark for Fairmont and Page had a steal and layup with 14 seconds left to make it a 64-60 game. Murray hit a pair of free throws with 10 seconds left to push the lead out to 66-63, after Fairmont’s Josh Duran nailed a corner three following Page’s score to trim the lead to one with 12 seconds left. Going up against a bigger Fairmont team than in years past, Werrell did not shy away from grinding in the post against the Golden Tornadoes bigs to score a game-high 20 points and pull down 14 rebounds. Kobe Davis had 14 points to lead Fairmont in scoring, along with 12 points from Jakeem Moore. Kaheem Pittman had nine points and 13 rebounds in the loss. In the girls’ contest, South Robeson beat Fairmont 56-16. Nytia Lewis had 21 points and 20 rebounds in the win for the Lady Mustangs, while Hailey Werrell and Jocelyn Maynor both collected eight boards. Georgianna Waters led Fairmont with six points. Fairmont hosts Lumberton on Saturday and South Robeson returns to conference play to take on West Columbus on the road Tuesday. LUMBERTON — After handing the Sandhills Athletic Conference leader its first conference loss of the season earlier this week, the Lumberton boys basketball team handed Richmond, the only winless team in conference play, its first league win on Friday in a 78-65 home loss. The Raiders (6-8, 1-4 SAC) scored 28 points in the second quarter and 24 points in the fourth quarter to take a six-point lead at the half and then pull away in the fourth quarter. The Pirates (10-4, 3-2 SAC) were hit by a slow start to the second half with 12 points coming in the stanza. Jordan McNeill scored a game-best 27 points for Lumberton. Senior forwards Kwashek Breeden and Braylan Grice had 13 and 10 points, respectively. Richmond’s Alex Quick had 19 points, while Xavier Pettigrew added 18 points and Nygie Stroman chipped in 14 points. 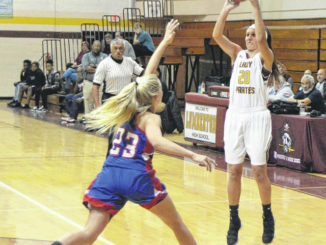 The Lumberton girls basketball team rebounded from an earlier loss this week with a 64-46 win over Richmond. Madison Canady had 20 points for the Lady Pirates (9-4, 3-2 SAC), and Rachel O’Neil added 12 points. Allyiah Swiney had 14 points for the Lady Raiders. 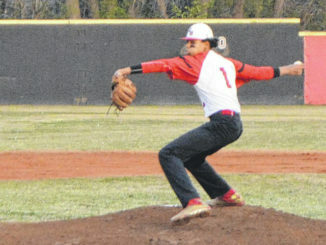 Lumberton travels to Fairmont on Saturday. 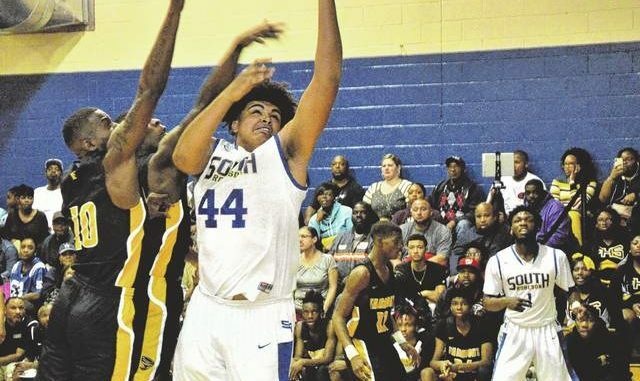 PEMBROKE — Purnell Swett’s woes in Sandhills Athletic Conference play continued on Friday as the boys and girls basketball teams lost to Seventy-First at home on Friday. The boys lost 70-68, while the Seventy-First girls defeated Purnell Swett 56-40. In the boys contest, the Rams (8-5, 1-4 SAC) rallied after entering the fourth quarter down 57-41. With three seconds left, the Rams missed the game-tying bucket on a contested layup. Leading Purnell Swett on the night was Darriante Parker with 20 points on four 3-pointers and six rebounds and Rufus Harris tallied a double-double with 16 points and 12 rebounds. Also adding a scoring lift for the Rams were Zack Carter with 14 points and Xavier Jones with 11. Emoni Howard had 21 points to lead Seventy-First (12-1, 4-1 SAC), while Brion McLaurin added 19 points. Purnell Swett travels to Lumberton on Friday. https://www.robesonian.com/wp-content/uploads/2019/01/web1_s-rob-bball-offense-3-edit-reduce-1.jpgDavid Bradley | The Robesonian South Robeson’s Cameron Werrell (44) collides with Fairmont defenders as he goes up for a layup on Friday as teammate Kylerr Page (1) watches on in the background. South Robeson closed the game on a late run to down Fairmont 66-65 at home.